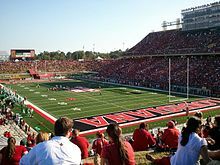 The Louisiana Ragin' Cajuns football program is a college football team that represents the University of Louisiana at Lafayette in the Sun Belt Conference. Between 2011 and 2014, the Cajuns won four consecutive New Orleans Bowls, representing the most successful stretch in the program's history, but later had to vacate two of the victories due to NCAA violations. ‡ Louisiana vacated the 2013 Sun Belt Conference co-championship due to major NCAA violations. Since joining the NCAA Division I-A (FBS) in 1978, the Ragin' Cajuns have played in six bowl games, although two of those games (which were victories) were vacated due to sanctions. Officially, they have a record of 2–2 in bowl games. In 1940 McNaspy Stadium was built on the campus of Southwestern Louisiana Institute (now University of Louisiana at Lafayette). It served as the Cajuns home field through the 1970 season and was demolished in 2000. McNaspy Stadium was located at the site where the current computer science building Oliver Hall now stands. ^ Hudspeth's official winnings are 29, but due to NCAA violations, 22 wins were scrubbed. If those violations wouldn't have occurred, Hudspeth would be 51-38. The Battle on the Bayou is the annual rivalry game between Louisiana Ragin' Cajuns and ULM. The wooden boot-shaped rivalry trophy was created in 2002 to be awarded to the victors. The first Sabine Shoe trophy was first awarded in 1937 to the winner of the SLI–Lamar football game. The name of the bronze rivalry trophy was derived from the Sabine River that forms the Texas-Louisiana border. USL defeated Lamar in the 1978 edition of the rivalry game, but the Ragin' Cajuns were not awarded the trophy as it had vanished. The Sabine Shoe trophy now sits in at trophy case in the Ragin' Cajun Athletic Complex. The Cajun Crown was the name of the rivalry trophy between USL and McNeese State. The Cypress Mug was the turned, polished mahogany mug awarded to the winner of the Southwestern–Southeastern football game. ^ "ULL Brand Guide and Graphic Standards Manual" (PDF). Retrieved March 27, 2016. ^ "Exam fraud, recruit payments among NCAA accusations against UL-Lafayette, ex-assistant coach David Saunders". The Baton Rouge Advocate. October 11, 2015. Retrieved October 20, 2015. ^ a b "2018 Media Guide" (PDF). ragincajuns.com. Louisiana Athletics. ^ "Tribal lore". The Sporting News. 1997. ^ "The Week". CNN. October 9, 1978. ^ "College Football Rivalries". www.1122productions.com. ^ "UL Lafayette Ragin' Cajuns Football Schedules and Future Schedules". fbschedules.com. Retrieved June 12, 2018.